Submitted 3 weeks 4 days ago by Norhaida Mohd Suaib. Dr Nga Pham was invited as a speaker in a workshop on "State Policies for Women in Academics - Legislation and Implications for Hanoi Law University" on 6 March 2019. 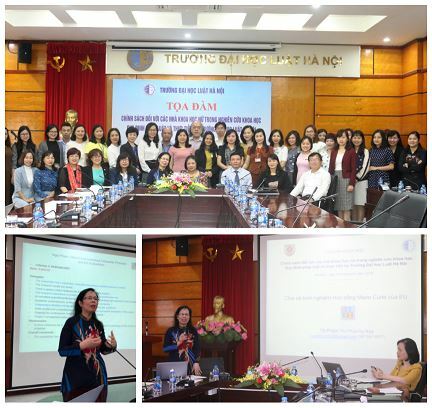 A total of about 40 attendees from research institutions and government such as MOST, Vietnam Women's Union (VWU), Vietnam National University (VNU), Viet Nam Union of Friendship Organizations (VUFO), Ministry of Justice (MOJ), Vietnam Court Academy (VCA) and Vietnam Women’s Academy (VWA) attended this workshop. The organising committee consists of Prof. Dr. CHU, Manh Hung – Rector of Hanoi Law University (HLU) and other faculty members and female academics from HLU. Dr Nga Pham covered introduction to the Marie Curie fellowship by the European Commission - a prestigious scholarship program which has been awarded to more than 100,000 applicants all over the world with more than 6 billions euros of fundings combined and potential policies that could be put in place to support female academics in pursuing their research, especially via the MSCA bottom up approach in which individuals can put forward their own proposals.